The crowd in Balboa Park. All photos by Doug Porter. The day started off with a surprise. Callers at the Department of Education reported that students at Mission Bay High School had walked out of classes and marched off campus. A few hours later the students were found, when they arrived, marching and chanting, for a scheduled teach-in at City College. 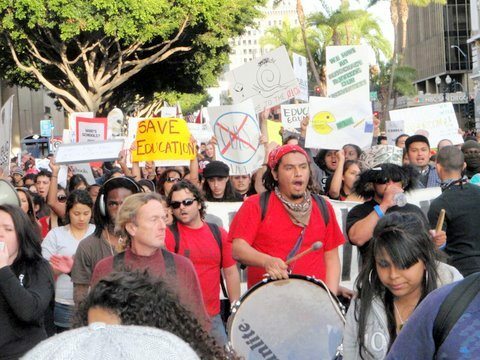 Walkouts, rallies and teach-ins happened at City, Grossmont, Mesa, State, and UCSD in the mornings. Students from all those schools convened for a regional rally at the Centro Cultural in Balboa Park. The lawn area was completely filled, as assorted speakers made pleas to the crowd to continue the struggle past this particular protest. After an hour of speeches, it was time to take the streets. Chanting “whose streets? 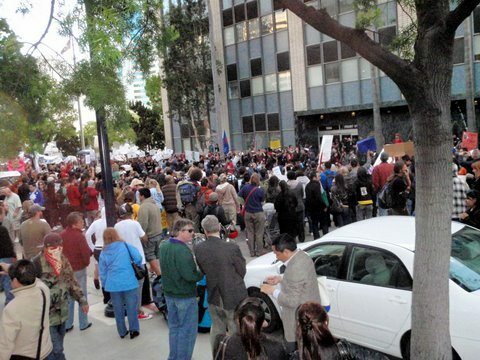 Our streets!”, the demonstrators quickly moved off the sidewalk and took over Park Boulevard. The crowd marched down to Broadway, and the chants of “They say cut back! We say fight back!” echoed off the buildings, filling the district with sound. Office workers poured out of buildings to watch, with many flashing the peace sign or otherwise showing their support. Finally, the demonstrators reached Front Street and turned towards their ultimate target, the Governor’s office. Outside the building, which was heavily guarded, the crowd chanted, drums beat out rhythms, and people paraded around showing off home made signs. Crowd estimates ranged from 1200 to 2000 people. Arriving at the San Diego Governor's Office. Go here for a 6 and half minute video of student protests at UC Berkeley, UC Santa Cruz and Oakland. Students, parents, teachers and other malcontents gathered at SF’s Civic Center this afternoon to protest public education cuts and more. San Francisco, March 4-The day was sunny. The convergence at the Civic Center in San Francisco was for the national Day of Action to protest cuts in public education, one. There were similar actions in 32 states and 40 California counti4es. The SF gathering represented all the diversity and exuberance and boldness and determination of the new student movement. “Save Our Schools!” rang out across the plaza and into the streets. On adjacent Grove Street school buses were parked on one side of the street and police vehicles on the other. And signs were everywhere: Fund Schools Not War, Why Pay More For Less, Bail Out Students Not Banks, Race To the Bottom Shame California, and the inimitable Three Word Sign. The already electrified crowd rocked out too, as expensively clad people on the mayor’s balcony across the street gawked and got their share of snaps before disappearing back into their den of iniquity. The song ended but the show went on. “On this stage today you will see not one elected official,” the emcee decreed, perhaps in response to the decadent display on the balcony. “NEVER AGAIN!” the call and response again in reference to their betrayal at every level of government. Away from the rally there is more action. Students are occupying Polk Street in front of City Hall, as well as the steps of The Gavinator’s playhouse. Cops have sealed off the block at each end. From the steps an unending roar of chants and near white noise fills the air. 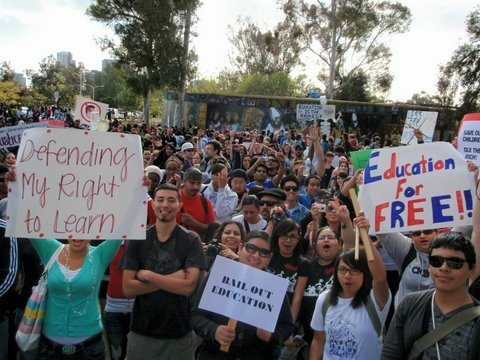 “Education Should Be Free, No Cuts, No Peace!” comes right at you frequently. Everyone seems to know the words by heart. I head over to the library for another kind of relief, one that’s provided by the public toilets there. Many demonstrators whose bladders are protesting as well accompany me. On my way in I notice that near the bike racks outside the House Of Books two people are sleeping on the sidewalk. When I get back another person has joined them. They are all African American men. Another African American man walks up to them, this one in a uniform. “You gotta get up and go,” he orders. They don’t. So they’re joined by a white uniformed man who takes over. “You like protests, don’t you?” he taunts them. “You do a lot of business.” Everyone else walks by, though the men on the sidewalk are dealing with the deepest cuts of all. When I come in a roundabout way back towards the Civic Center, a boisterous march is breaking away from the rally and moving fast towards Market Street. Police on motorcycles are moving up on them as they meet Market. But it turns out that’s only to play traffic cops as they accompany them. The march takes one lane of Market and hoofs it downtown while people along the way pour out of stores to cheer them on. Except for security guards of businesses along the way, who check to make sure none of their merchandise is about to be liberated. But then the street marching students hook another quick left onto the steepest part of Pine Street. Those at the head of the march start sprinting up the hill, and the rest of the protesters run after them. The police presence, which has gradually increased along the march, is literally left in the dust. The cops catch up with the march after it makes another left downhill on Polk Street. When the procession nears the trolley car turnaround at Market, a trolley’s driver stopped there clangs out a beat long and loud in solidarity. The march heads back up Market to UN Plaza, where it circles up for a loud last collective clap of exhilaration. “It starts slow and picks up speed fast, just like the movement,” someone explains. I head back to Civic Center Plaza, where the rally is over and they’re taking down the stage. I spot a sign stuck in a large ceramic planter. “Let my people learn!” it proclaims. Yes, they are. And fast. Even in Redding, I joined more than 350 people, teachers, students, school board members, administrators from around the Shasta Countyounty, rallied against the school cuts. Signs along the main street outside Redding City Hall got almost exclusively positive honks from passing cars. Thanks for this coverage, Doug and Mike. It inspires. I heard a lot went on in the East Bay as well. Go to this Bay Area media website for a great 6 1/2 minute video of student protests at UC Berkeley, Oakland and UC Santa Cruz. 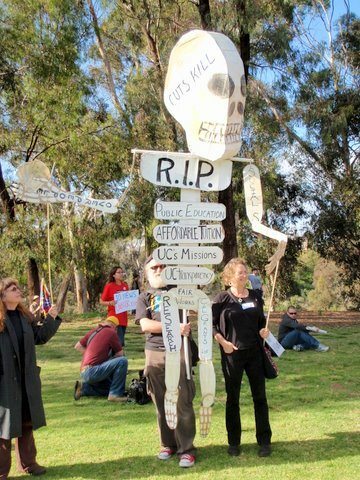 That’s not Rich Kacmar is it holding up the skeleton puppet? You bet that was Richard! The ’round up’ of reports on March 4 actions is going to take a while. But it is worth the effort. The corporate news organs have been forced by the sheer vastness of the actions to report something about it. But MOST of the information is only available by searching on the internet. Go OB Rag! Go! It is a MAJOR MISTAKE to brand this as a “student movement”. THE CORPORATE NEWS MEDIA WANTS US TO THINK IT IS “ONLY” A STUDENT MOVEMENT. Students are clearly the numerical majority at most of the actions yesterday. However, virtually ALL of the unions in the public education system are behind this movement, and many of the unions in the rest of the public sector, and lots of unions in the private sector. It is probably better to describe this new movement as a WORKING CLASS movement against the re-segregation and class stratification of education and against the grossly obvious moral outrages of bailouts for the biggest banks and welfare for corporate war profiteers and huge tax breaks for the tiny wealthy minority, while we get systematic cut-backs in the standard of living for the vast majority of our people — and it is going on globally, which is why this is more than just a national movement in one country. We had actions in MANY other countries on March 4. The real scope of this movement is going to scare the ruling elites to their core. We must not allow them to divide us by branding this as a “student” movement. Check out the YouTube video of San Diego actions, just put up Saturday March 6. How long does moderation take, and do posts ever simply go up on the blog without being moderated?